I thought I would share another card of mine with you. This one makes me laugh because unintentionally I made a Christmas birthday card for someone whose birthday is November. Perhaps it is the red and white color scheme or candy striped ribbon? Regardless, I hope the person I sent it to felt a little more jolly (ha, ha) from receiving it in the mail. One of my missions in making this card was to use one of my many Kenner Road stamps. I compulsively collect buy these stamps. They are beautiful vintage style stamps that are included in the swoon-worthy Kenner Road kits (I have never swooned, but I imagine it is something akin to the loss of breath from the excitement and joy I feel just looking at these kits). If you love paper crafting of any sort and have a hankering for vintage go check out Kenner Road. This is vintage loveliness at its best and the lady--Kerry Lynn Yeary known as kl--who lovingly designs the kits (when you see the kits you will know she puts a lot of care into creating them which can only be described as love) is an awesome paper craft artist. kl has a great blog: live. craft. learn. Be inspired and don't blame me too much if you can't stop yourself from subscribing. I admit it: I am an enabler. 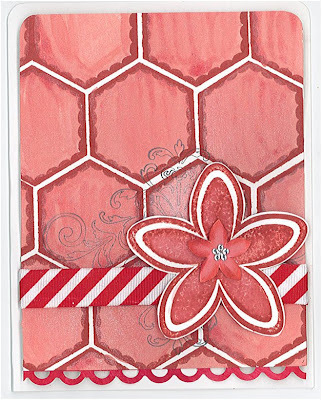 Stamps: Scalloped Hexagon, Kenner Road; Flowers (from the Office Accoutrement set) and Flourish (from the Kind Thoughts set), Stampin' Up! Ink: Fired Brick, Tim Holtz Distress Ink (Ranger); Basic Gray, Stampin' Up!